A Community of Opportunity should be safe from physical and social threats, including violence or trauma of any kind. It should be free of toxic compounds in the water, land, and air. It should have excellent schools, affordable transit options, and ample access to nature. Its residents should have access to affordable health care, and to social and mental health services. It should have stores selling healthy and affordable food, include diverse peoples, housing types, and opportunities, with a prevalence of working families. The characteristics that give rise to or depress opportunity and wellbeing are called the social determinants of health. 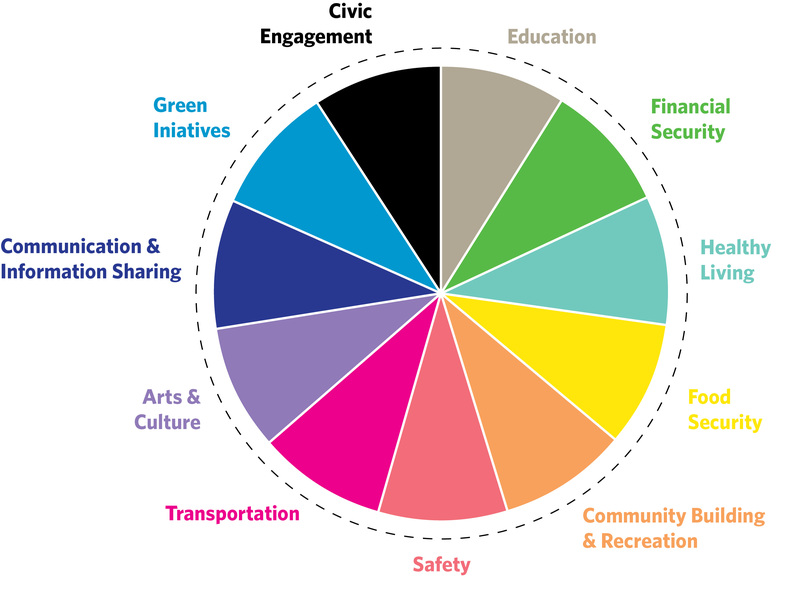 The categories listed in the wedges of the circle above are all key to achieving Communities of Opportunity. However, the development of these characteristics in low opportunity neighborhoods takes a concerted public strategy, generations of time, and a great deal of public investment in community infrastructure. We propose a model of transforming affordable housing buildings into Communities of Opportunity, joining private sector capital and management with public sector and not-for-profit resources, partnering with neighborhood health care, social service, education and other agencies. Our methodology is to co-create pathways to opportunity in each community, working alongside residents and neighborhood institutions. We seek results that improve the social determinants of health and create opportunity in the buildings across our portfolio of affordable and mixed income housing and in new communities that we build. Our goal is to prove that there are scalable strategies that can make a palpable difference In our residents' lives. Nearly 19 million families in the United States are severely housing insecure, paying over half of their income on their housing costs, and often living in communities disconnected from opportunity.